Synopsis: Recorded before a live studio audience, “Unmasked” was an original comedy series that offered up candid, one-on-one interviews with both established and emerging comedic talent for an uncensored look into their creative process and the lives that shape their comedy. 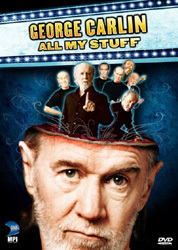 Comedic legend George Carlin was the inaugural guest when “Unmasked” premiered exclusively on XM Radio on Saturday, September 22, 2007. This interview with George Carlin is an oddity to say the least: it’s a one-on-one that Carlin did for XM Radio and which was filmed for posterity’s sake. Consequently, it’s very static because Carlin and Sonny Fox, the interviewer, are just sitting in chairs, gabbing; for obvious reasons, there are no visual aids/cues/props. Usually, George Carlin is a fascinating individual, an excellent conversationalist, but I found that he rambled on too much in ‘Unmasked’. He also covered some of what he already said in ‘George on George‘. While a skilled speaker can usually keep repetitious material fresh, here Carlin stretched each bit out all the while managing to provide less meat than there was in the more concise versions of his tales – thereby making this document somewhat redundant. Of course, he wasn’t helped one bit by that fact that Fox’s interviewing skills weren’t especially sharp: he was asking fairly basic questions and did not lead the conversation very well; it all felt awkward, like their hearts weren’t really in it. There was even supposed to be a set of questions from an in-studio audience, but Fox managed to squander that time and only squeezed out 12 mins out of the whole 80 – which meant that only three people got to speak with Carlin. While Carlin is always good, even when he’s not in top form, this programme left me wanting. I wouldn’t recommend this as a first glimpse at the comic trailblazer; it’s a mediocre document that only die-hard completists should bother with. Wow. What an unnecessarily snooty critique. It felt very warm and personal to me… Fox was amazingly in sync with Carlin – Carlin mentions a conversation with his brother that includes a reference to an obscure toothpaste brand from the ’40s… Fox knows the brand’s spokesperson. He gives carlin room to tell his stories. Carlin wasn’t out to get laughs, he was delivering a life narrative. I found it compelling! It definitely deserves more credit than your cheap treatment. This is a great interview and loaded with insights. It’s so nice when someone is not “on” and is rather just themselves. Maybe the critic would like george to go off the high board on skates..JEEEEEESSSHHH!!! !